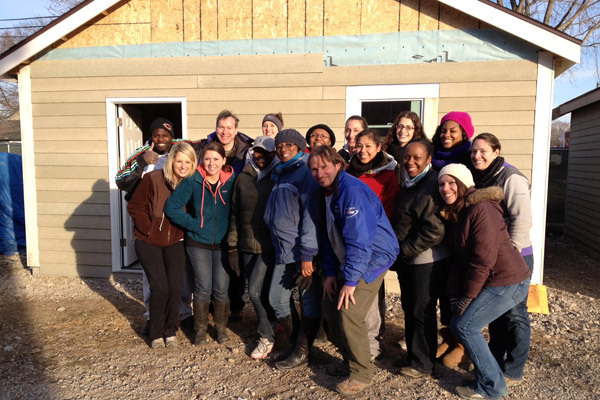 On November 27, recently dubbed #GivingTuesday, a day-long initiative dedicated to giving back, Edelman sent 45 employees out to two Chicagoland Habitat for Humanity home building sites in West Pullman and Waukegan, Illinois. On November 27, recently dubbed #GivingTuesday, a day-long initiative dedicated to giving back, Edelman sent 45 employees out to two Chicagoland Habitat for Humanity home building sites in West Pullman and Waukegan, Illinois. The volunteers installed siding, framing, and interior drywall, and performed other home building tasks from 9 am to 3:30 pm. While these volunteers were busy at work, they also turned to their social networks to raise awareness of homelessness in Chicago and to drive potential donors to the Habitat for Humanity website. In addition to the employees who volunteered at the building sites, nearly 50 employees at the Edelman Chicago office took part in #GivingTuesday by logging on to Twitter, Facebook, and Instagram to share photos and live updates from the Habitat building sites. Remote employees also developed their own tweets using Habitat home ownership data and pre-approved hashtags (#EdelChiGives and #GivingTuesday). Edelman's digital experts later compiled an end-of-day highlight reel to display the tweets, Instagram photos, and overall impressions secured on #GivingTuesday. With more than 155 unique Tweets and 30 Instagram photos, Edelman employees reached more than 350,000 people online. In March, Edelman Chicago engaged with local leaders of Habitat for Humanity during an all-day strategy session to help Habitat better understand and overcome its communications challenges. A few months later, Edelman circled back with Habitat and presented the idea of re-engaging with the organization to raise awareness and drive key messaging on #GivingTuesday. Habitat accepted Edelman's help, and planning began immediately to make a memorable and impactful giving experience. Edelman took part in #GivingTuesday because its workforce and leadership recognize the duty and value in giving back to local causes. Dan Edelman opened the agency's doors in Chicago 60 years ago, and the firm's commitment to giving back locally remains a key part of Edelman's culture and citizenship.